The countdown to such a big race usually starts a week if not two before. Training is done, all preparation done, the only point is to keep yourself injury free, calm and healthy. And then it comes. A week before, a super innocent movement and hitting a small, hidden obstacle in the grass, has caused me such pain in another leg that I was barely able to walk. At that very moment many things went through my head, but a single one was going to overtake. 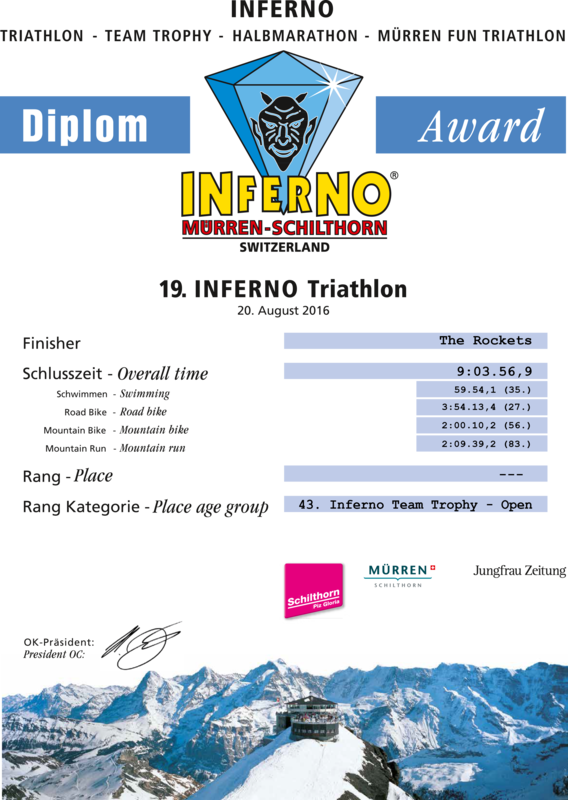 Already tanked with the experience of how to do the race with extensive pain (Zell am See, Austria, 2015), I was thinking: here we go again. That’s why they invented the slogan “Anything is Possible”. I had to prove it was true again and again. So let’s do it. The positive thing was: still a week to go, maybe it would improve. I would need to find the way of how to speed-up the healing. Certainly not by lying in bed. After the second day I felt slightly better, a tiny improvement while walking fast. The hope was back. But then again, three days before the race, I got a kind of strange pain in the back when I bent myself. That one was also there only when I bent and when I stood-up afterwards. It was clear: the race was going to be painful, but I did not give up. Followed by a tiny blister on my left foot, my injuries faded somehow.I was there on a sunny Sunday 6 times in a row looking at a beautiful lake and a long line of ladies waiting to start the race. I was in the last starting age group. I could immediately imagine how a full transition zone would be when I came back and how devastating it would be to see many runners with a band on the arm while starting the run. Two loops- two bands. Everyone was running their own race for a different reason. My wish was to execute the race properly and to finish strong. Every time I was there at the starting line, the circumstances were different. The point for me was to race at the edge or even above the edge. It sounded like gambling, and in the end any wrong decision would come back like a boomerang. It could fly a long way, but it would turn and come back. With such thoughts I started to plan my race. After having warmed up in the pool for good 20 minutes, I moved to the line without hurry in a lazy manner. I could feel the excitement,a kind of strong, invisible, electrical field that shook the athletes, while waiting to go. Maybe it was good for the heart to wear a swim suite. The line was long, and I chose to stay close to the front. The rolling start was a good thing apart you placed yourself in a wrong group. Now I dare to conclude that my estimation was the right one. I had only one collision, a short stop as of a kick I got in the head. But it was all right. My swim was effortless and fast. The transition was close to perfect apart from the trouble to open the bag I closed more tightly the day before. While running through the transition zone, I noticed that a lot of bikes were still there. That was a good sign, as I started in the last age group. The mounting was excellent, and we were all off for a 90 km bike ride. The bike course consisted of two 45 km loops with famous hills such as a Golden and Witches’ hill. The second one was where locals dressed as witches provided standing ovations. Heavy dark costumes and cheering along the way attacked my glimpses, made me smile and progress further. Both times. On the downhill sections I was careful as usual, but the real speed and overwhelming feelings bursted when I was overtaking on the flatter parts. I wanted to improve my overall bike time, so on the flat sections I had no choice: paddling hard. It felt like gambling. I hoped that my legs would work on the run as I did much more running that season than biking. Unfortunately, on the second loop I lost 5 minutes somehow, so I was not able to reach sub 3 h bike ride. The intention was there and I worked hard. With slight disappointment I reached the transition zone. For a moment I compared those 4 minutes to the next 120 minutes that would shape the rest of the race. I knew that it could be quite easy to jump to 130 minutes or even more on the run under such weather conditions. That was exactly the point of my race. I needed to hold the pace and perform till the end, no matter how hard it was. At that point, the mental component started to play a crucial role. How deep we could quiet the mind and how well we could ignore the emerging pain. On the first 5-6 km I felt like I was pushing hard through the thick, densely packed, transparent substance. That time, probably because of the lesson experienced during the marathon, I resisted, readjusted the steps and started to turn the race into a positive direction. I felt down, but in such moments it was the mind shift that had to take place. And then step by step I was coming back, moving forward and increasing the pace. The distance and time were not important any more. 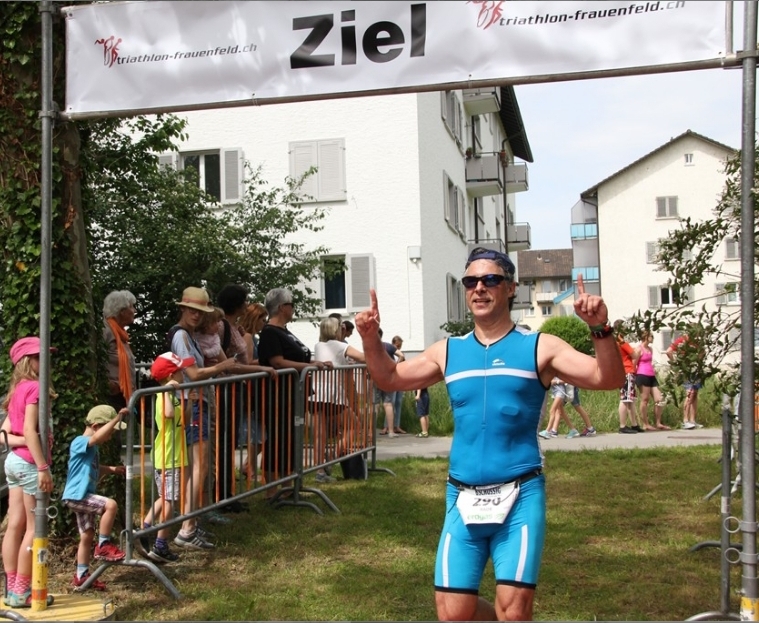 After 2 h of running and 5:44 h racing I managed to finish my 11th IM 70.3. 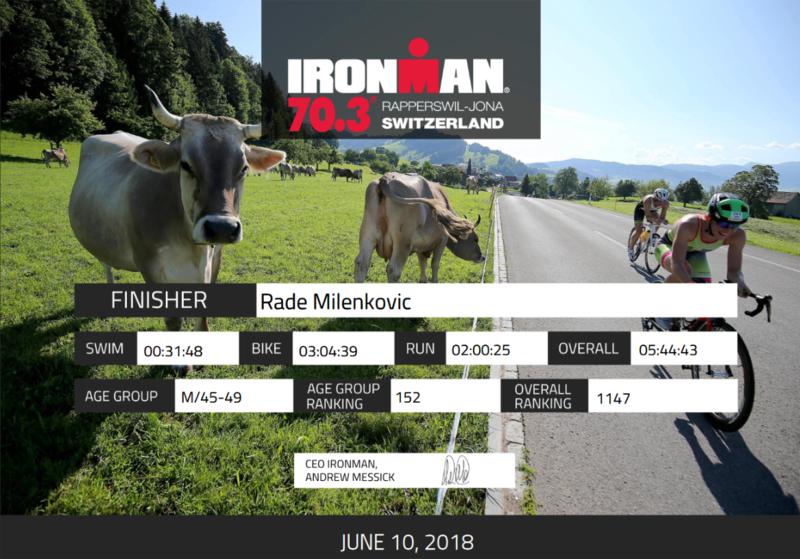 This entry was posted in вести, ironman703, rade. Bookmark the permalink.